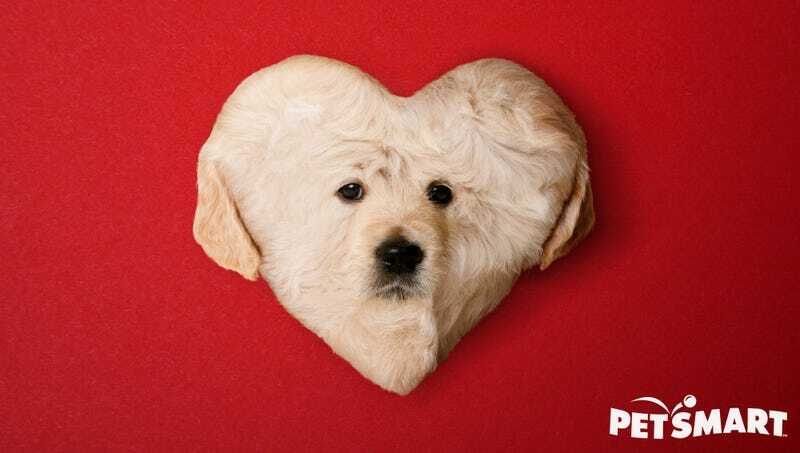 PHOENIX—Calling it the perfect expression of affection for that special animal lover in your life, PetSmart reportedly introduced the world’s first heart-shaped puppy this week just in time for Valentine’s Day. “We believe that your significant other deserves a genetically modified companion as completely unique as they are,” said Director of Product Development Zoe Sinclair, who noted that PetSmart’s entire collection of 3-month-old black lab, golden retriever, and Dalmatian puppies is lovingly crafted by Belgian spine-fusing and rib-removing veterinary technicians who hand-inspect each dog to ensure proper shape, color, and texture. “Can you say ‘swoon?’ Plus, every heart-shaped puppy is engraved with a personalized message on the back and shipped to your door in a special red velvet kennel to ensure proper spinal curvature throughout the puppy’s full two- to three-week lifespan. It’s almost too much!” Acknowledging that not everyone’s sweetheart is a “dog person,” PetSmart also unveiled a limited Valentine’s Day-edition crystal vase of a dozen fresh-cut, long-stemmed kittens.